All Zonal Railways and PUs. Sub: Validity of Kit Passes and Journey Passes, issued on account of transfer/settlement/death. In terms of Schedule-l (Duty Pass) of Railway Servants (Pass) Rules, 1986 (Second Edition-1993). 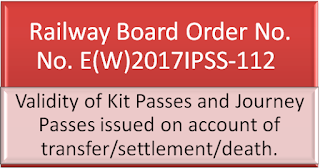 Kit Pass to serving Railway employee is admissible on transfer. Similarly, Item (16) (i) & (vii) under Schedule-Vii (Special Passes) of the aforesaid Pass Rules provides for issue of Settlement/Kit Pass on retirement/death of Railway employee. 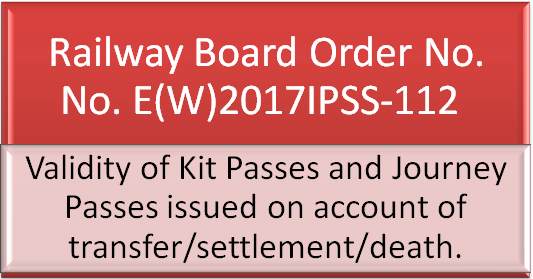 in terms of Board's letter No.E(W)2001/PSS-916 dated 14.12.2006, validity of Kit Passes has been stipulated as three months from the date of issue. However, in these rules, validity period of transfer passes and settlement passes. as admissible to both serving as well as retired Railway employees (as the case may be) on account of transfer/settlement/death has not been stipulated. 2. The issue of validity period of such passes has been considered in Board's office. it has been decided that validity of Transfer Passe’s, Kit Passes and Settlement Passes on account of transfer/settlement/death. in respect of serving as well as retired Railway servant, will be at par with the extant validity period of ½ set of Privilege Pass counted from the date of issue of such passes. The issue of validity period of such passes has been considered in Board's office. it has been decided that validity of Transfer Passe’s, Kit Passes and Settlement Passes on account of transfer/settlement/death.